Tonight Is The Night! Belltown Community Center Grand Opening! Fellow Belltowners, this is amazing. Since moving to Belltown with my family four years ago, this was a distant dream- having a community center. The last four years have been filled with people and families intentionally moving to the city, business owners opening up successful business with the goal of being assets to the community, people stepping up and volunteering to create Belltown festivals and community mingling events. Friends, this neighborhood is flourishing! And it is because of you, you know who you are. People that care to serve and love this neighborhood more than just use up its resources. I’ve seen the plans for things like the Bell Street Park and park plans to be created at the entrance of the tunnel. I’ve heard whispers of a children’s play are with slides and the lot going up at Seattle Center. This is The place to live with your family. And until this point, it has not been. We’ve seen some low income housing go up, diversifying our neighborhood. We’re seeing apartment and condo buildings pop up all over Belltown and Downtown Seattle. And one has to wonder.. why? Well, it is because this is the premier neighborhood to live in Downtown Seattle. And it is a community filled with people from all backgrounds that love living in the city. We welcome this Community Center with cheering hearts and cannot wait to see all of the relationships that are built and friendships that are made, amongst neighbors, here. 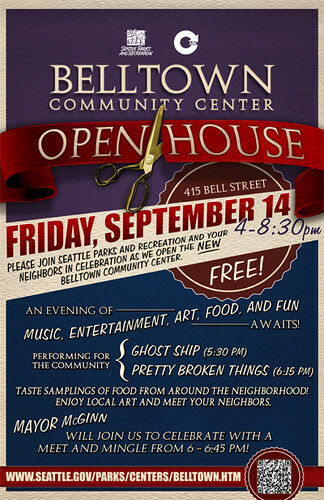 See you tonight as we celebrate the Grand Opening of our Belltown Neighborhood Community Center!